Venezuelans were in the streets the morning of Jan. 23 in a massive show of support for President Nicolás Maduro and the program of the pro-working class Bolivarian Revolution. They expressed determination to push back the latest counterrevolutionary attack emanating from Washington. Chavista forces routed a short-lived rebellion by members of the National Guard on Jan. 21. According to venezuelaanalysis.com, several dozen right-wing residents then erected burning street barricades and torched symbols of the Bolivarian government. 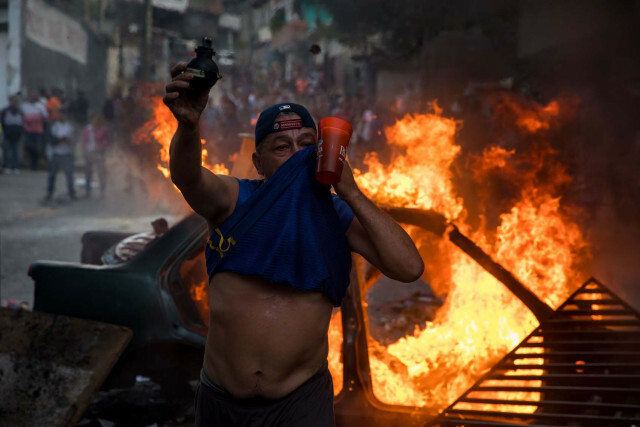 The hand grenade pictured in the hand of a protester once again points to incitement by the U.S. and its regime-change agents in Latin America. The U.S. has openly declared its intention to undo the gains made for the poorest and most oppressed Venezuelans by the Bolivarian process — up to and including direct military intervention. On Jan. 22, U.S. Vice President Mike Pence appealed directly to Venezuelans in a video message with Spanish subtitles. He declared that the U.S. is with the opposition and called on people to come out in the streets against Maduro’s government. In a further escalation, on Jan. 23, President Donald Trump recognized opposition figure Juan Guaido as the interim president of Venezuela. The governments of Canada, Colombia and Brazil quickly followed. Any bloodshed or destruction is on the hands of Pence, President Donald Trump, the Pentagon and their oil-hungry corporate backers. Workers and oppressed peoples in the U.S. have no interest in another war for oil, this time waged in Latin America. A recent documentary, Venezuela: The Shadow Agenda, explains that the U.S. goal has nothing to do with spreading “democracy.” The democracy that Pence espouses is for the rich, the corporations and banks, not for the workers, the poor, Indigenous or Black Venezuelans. We remember how the U.S. engineered the Sept. 11, 1973, coup in Chile against the democratically elected socialist Salvador Allende. The brutal Pinochet dictatorship followed. On Jan. 10, Bolivarian Venezuela inaugurated its president, Nicolás Maduro, for a second term. It was a victory that Maduro, formerly a leader of the bus drivers’ union, took office. Venezuelans have had to overcome multifaceted imperialist attacks aimed at destroying the pro-socialist, internationalist project begun by Hugo Chávez, which continues the struggle for independence and liberation envisioned by Simón Bolívar. Years of U.S.-imposed economic sanctions, guarimbas (violent street protests) and unceasing media lies, combined with falling oil prices, have failed to defeat the Maduro presidency. This makes the U.S. suggestions of a military option much more ominous. In the days leading up to Maduro’s inauguration on Jan. 8, Resumen Latinoamericano shared video of U.S. helicopter gunships landing at a military base in Panama. Panama’s President Juan Carlos Varela met with the U.S. Southern Command in Florida on Jan. 5. This was a clear threat to Venezuela. Right-wing regimes in Colombia and Brazil, loyal to their masters in Washington, also present a clear and present danger. The U.S. war against Bolivarian Venezuela isn’t new. In the April 2002 coup attempt against President Hugo Chávez — captured by a visiting Irish film crew in “The Revolution Will Not be Televised” — Washington showed its hand with fake newscasts and statements of support for the coup-makers. And on March 9, 2015, President Barack Obama issued an executive order declaring Venezuela a threat to U.S national security. This action became the basis for further sanctions, causing more hardships for the Venezuelan people. Now is the time for all opponents of war, racism and economic exploitation to take action to demand: U.S. hands off Venezuela!